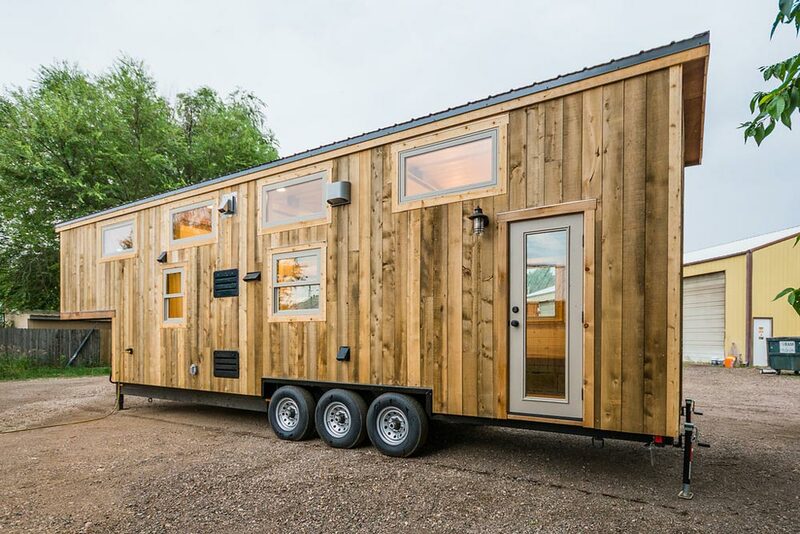 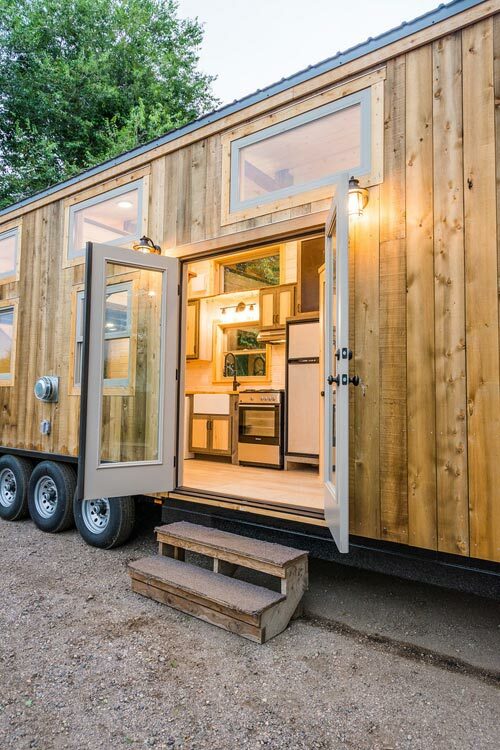 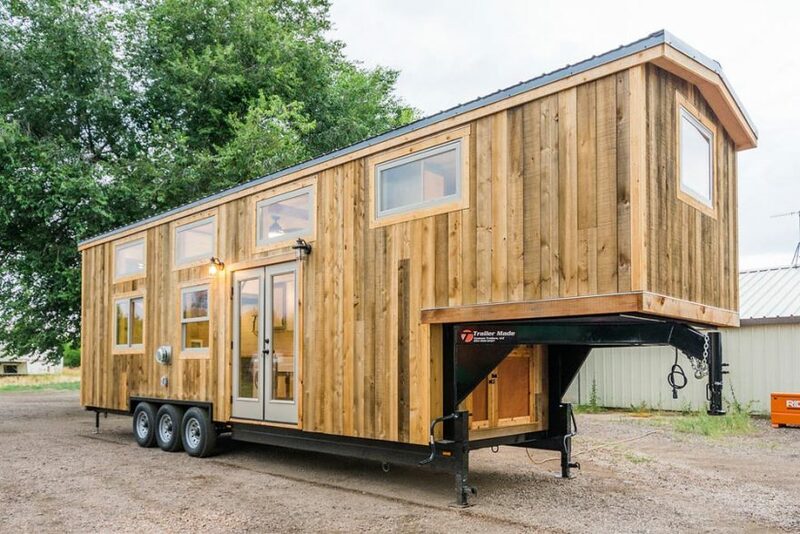 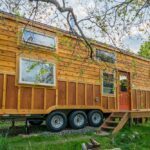 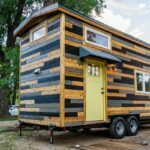 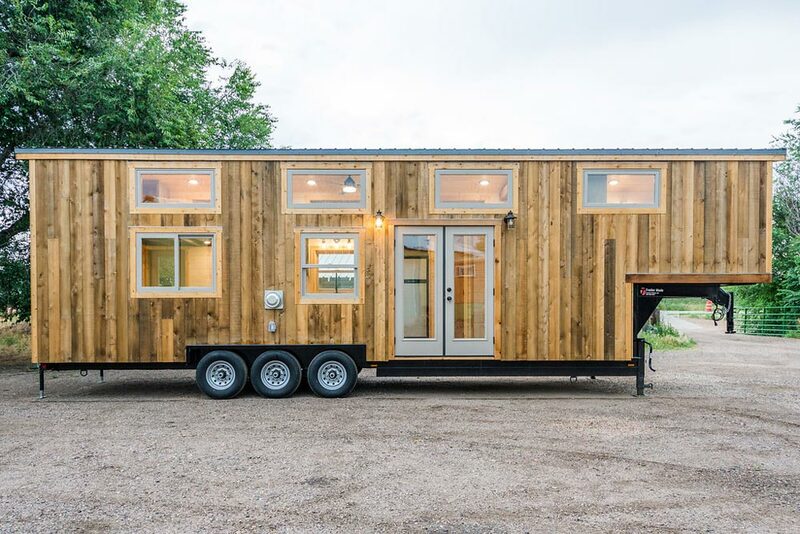 From Fort Collins, Colorado-based MitchCraft Tiny Homes is this 37′ gooseneck tiny house on wheels. 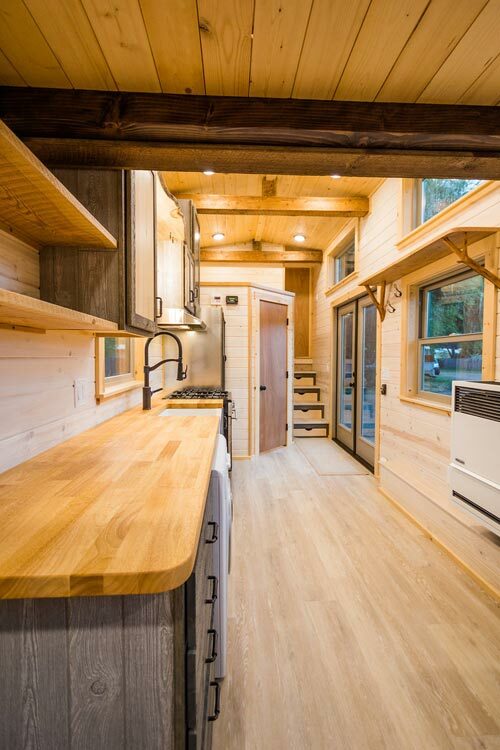 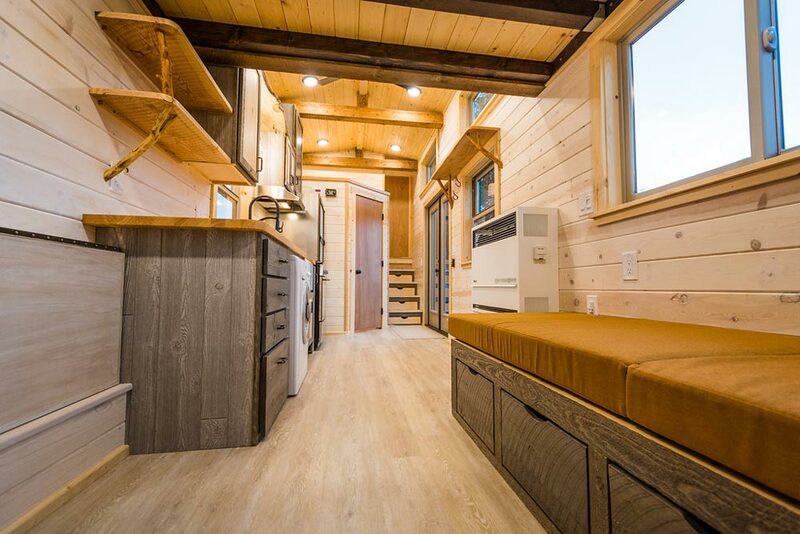 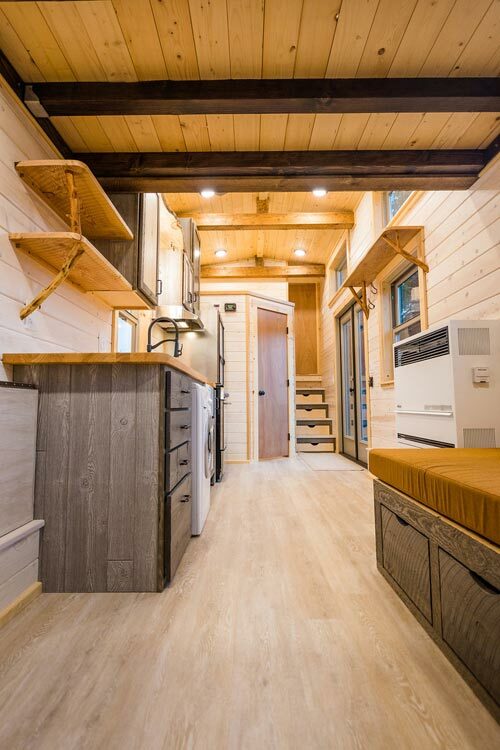 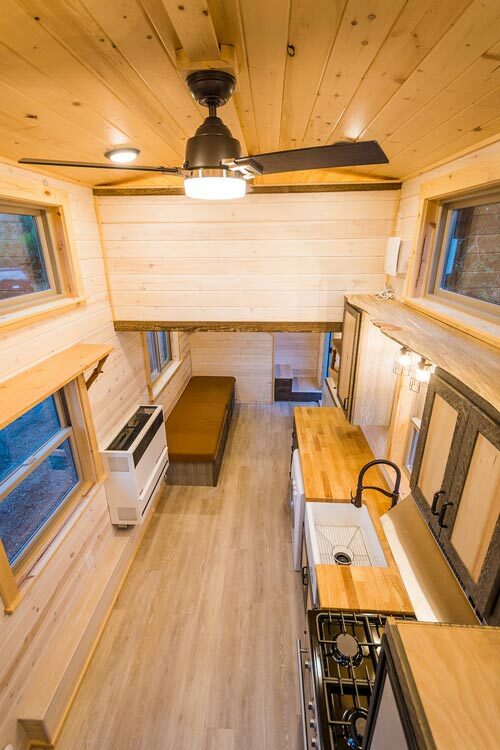 Built for their client, Heather, the custom tiny house features a rustic aesthetic that will fit nicely in its new home outside of Jackson, Wyoming. 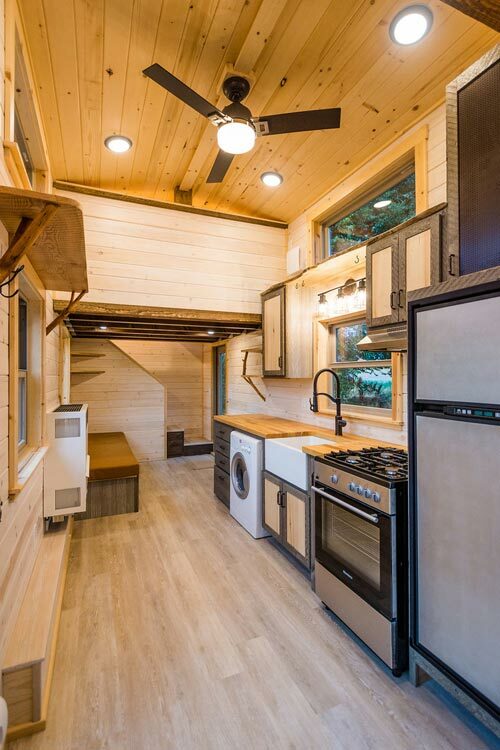 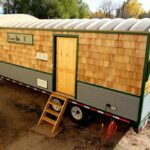 The gooseneck tiny house measures approximately 360-square-feet including the private bedroom loft. 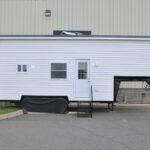 The main entryway has double full light french doors and there is a back door as well. 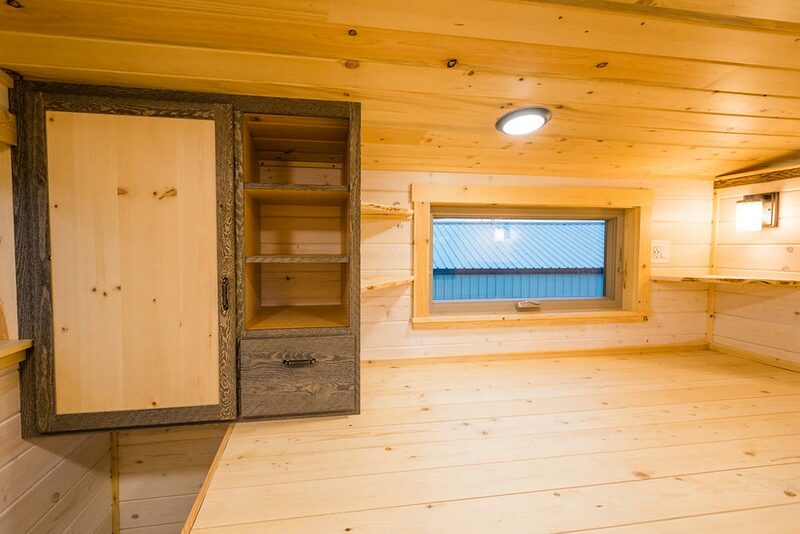 The master bedroom is located up a short flight of storage stairs over the gooseneck. 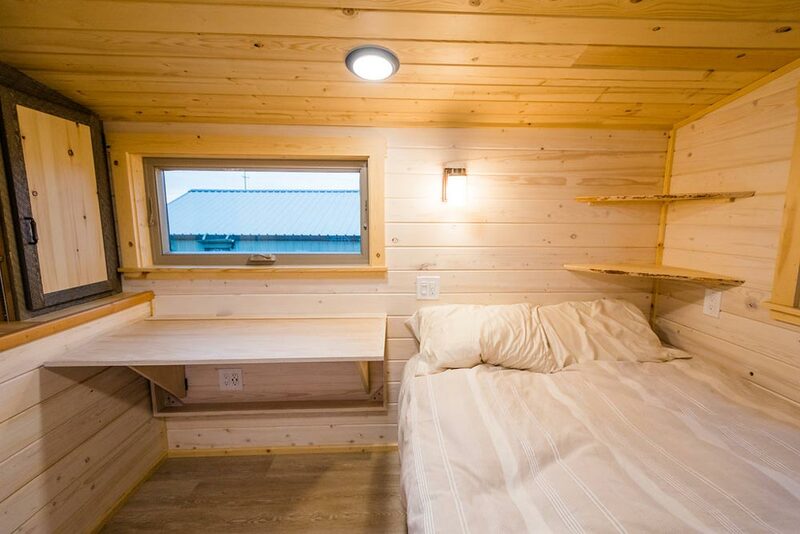 In the bedroom is a fold down desk, bed platform with pull-out drawers, built-in shelves with natural branch supports, and a closet area with two cabinets and a set of shelves. 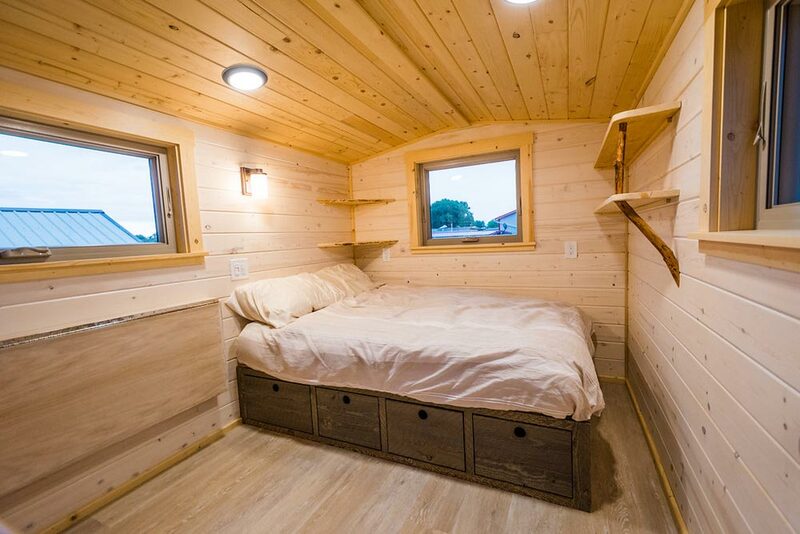 At the other end of the house is a bedroom loft with landing platform for extra headroom, closet area, and corner shelves. 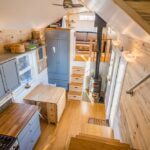 The staircase to the loft is located against the back wall and stores a 100-gallon fresh water tank. 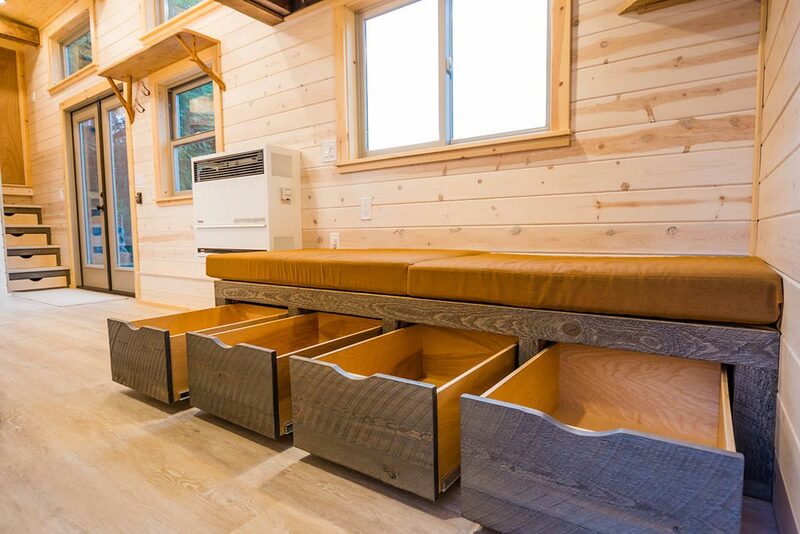 In the living room is a built-in 7-foot bench seat that pulls out into a bed and also has deep pull-out storage drawers. 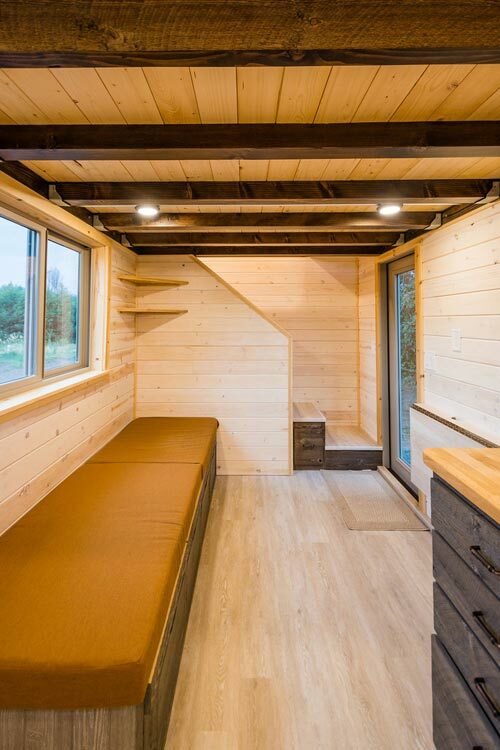 Across from the seating area is a fold down table. 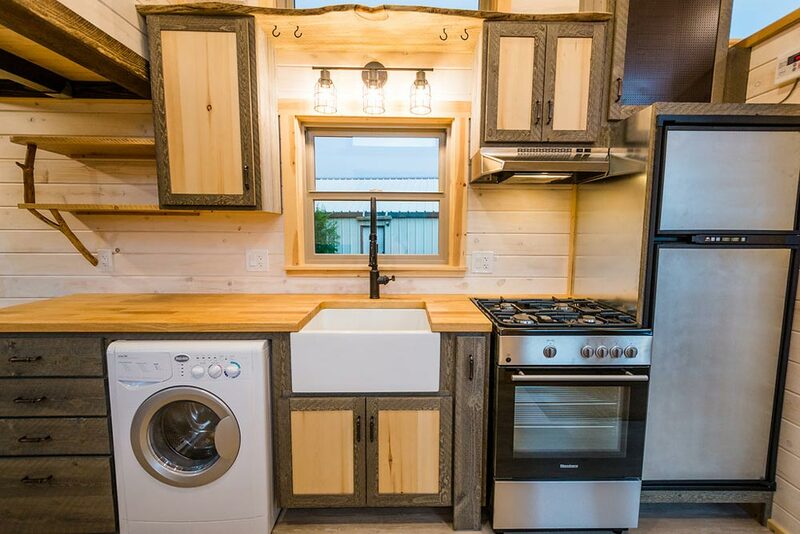 The kitchen features a propane range and refrigerator, washer/dryer combo, and farmhouse sink. 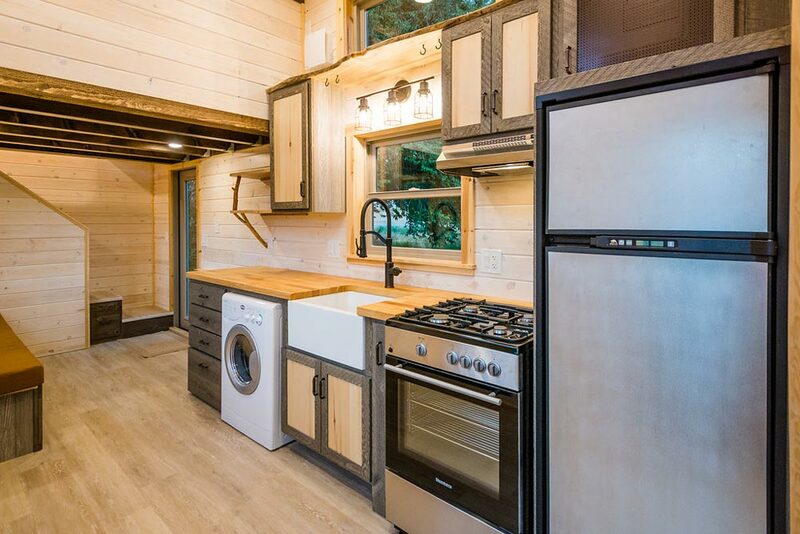 Custom cabinets, shelves with natural branch supports, and a butcher block counter finish out the rustic kitchen. 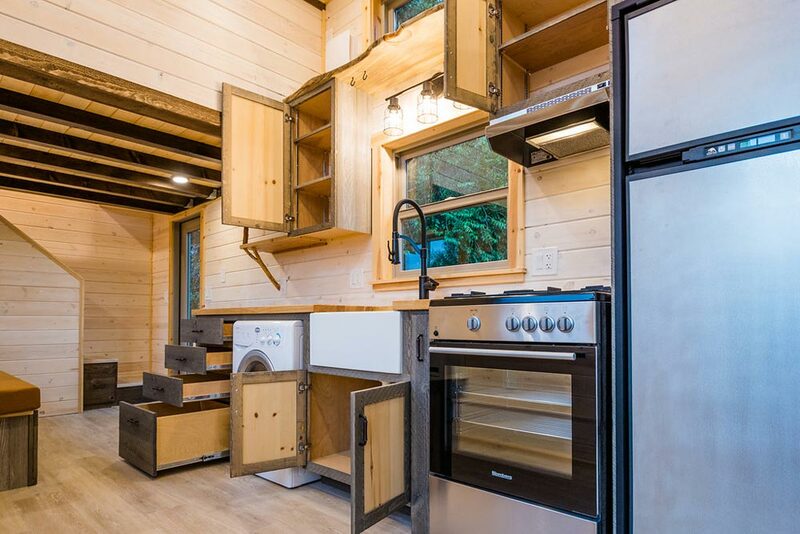 There is also a live edge shelf that spans across the upper cabinets. 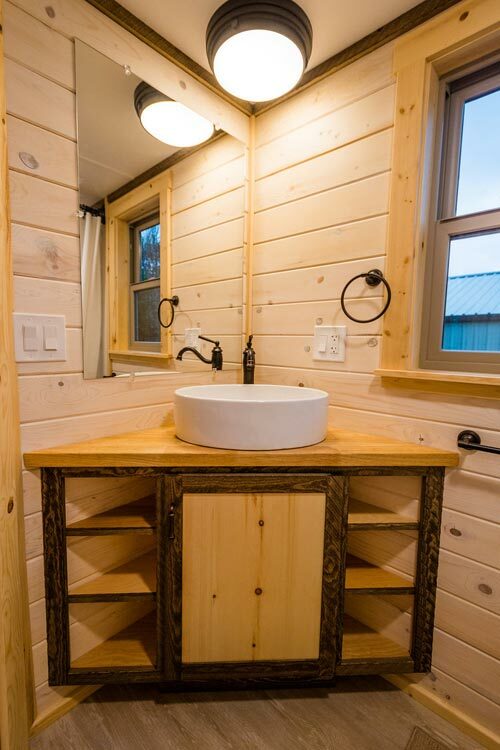 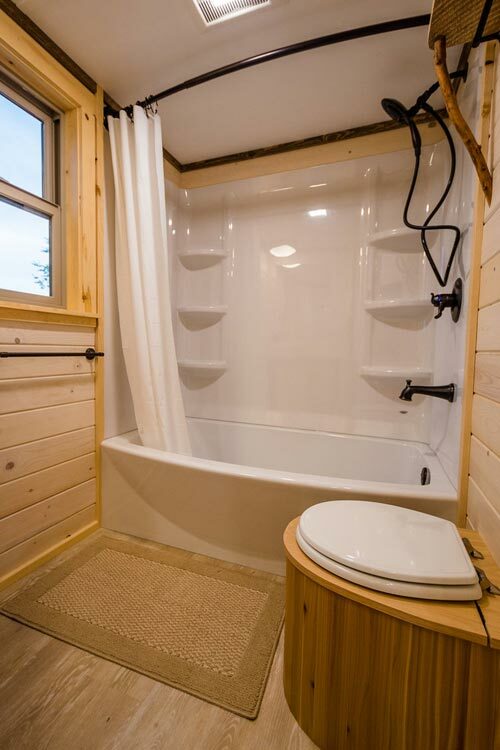 In the bathroom you’ll find a corner vanity with vessel sink, a full size shower/tub combo, and a composting toilet. 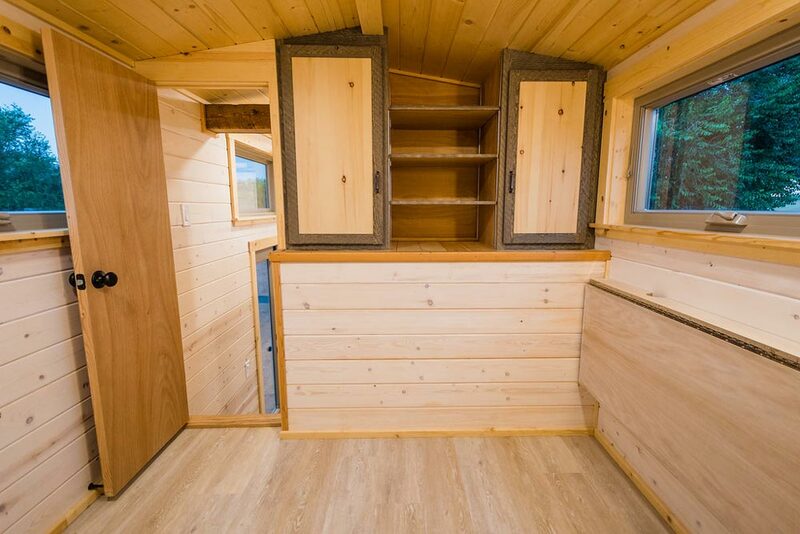 For more information about Heather’s 37′ Gooseneck Tiny House, please contact Mitchcraft Tiny Homes. 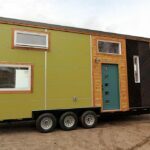 Also available from MitchCraft Tiny Homes: Laura's Tiny House, 20' Tiny House, Kailey's 22' Off-Grid Tiny House, KerriJo's Tiny House, Heather's 37' Gooseneck Tiny House, Francelia's Tiny House, Tara's 33' Gooseneck Tiny House, Davis' Off-Grid Tiny House, Julia's Tiny House, Curtis & April's Tiny House, Eric & Oliver's Tiny House, Elise & Clara's Tiny House, Dennis' Tiny House, Jessica's Tiny House, Bookworm, Blue Moon.